Figure 8 of Querques, Mol Vis 2009; 15:2960-2972. Figure 8. Color fundus photographs, fundus autofluorescence frames and spectral-domain optical coherence tomography scans of patient CT01 and patient FG08. 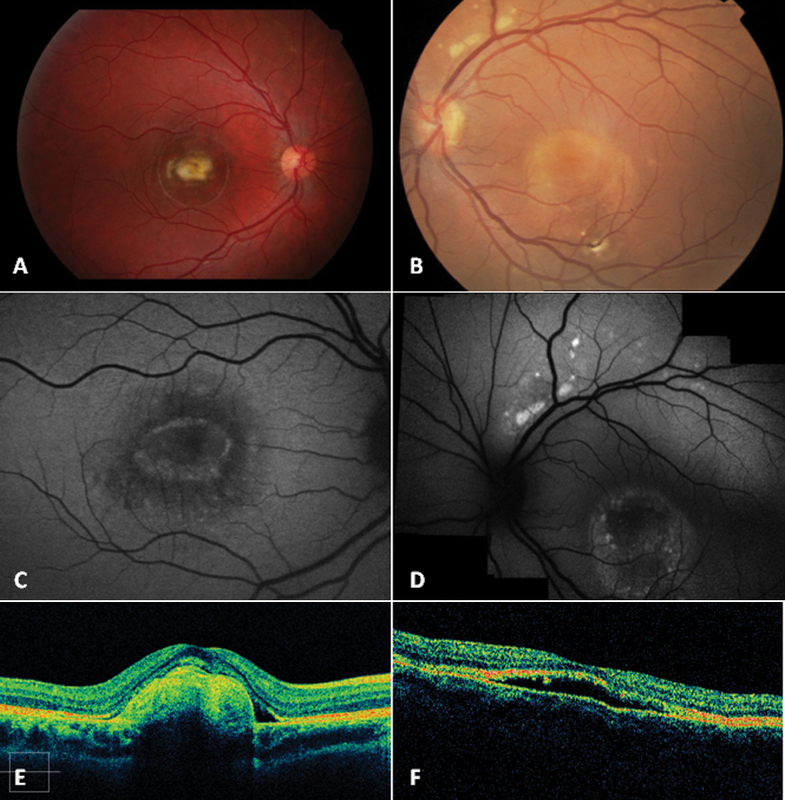 Color fundus photographs show the fibrotic lesion of patient CT01 (A), characterized by an aspect of macular fibrosis without any detectable active choroidal neovascularization, and the multifocal vitelliform lesions of patient FG08 (B), characterized by a vitelliruptive aspect within the macular area. The fibrotic lesion of patient CT01 is responsible for reduced autofluorescence within the macula, on fundus autofluorescence frames (C), as well as for a prominent hyper reflective thickening at the level of the retinal pigment epithelium (RPE) inducing marked anterior bulging, accompanied by thinning of the sensory retina, on spectral domain high-definition optical coherence tomography scan (E); the multifocal vitelliform lesions of patient FG08 are visualized as multiple hyperautofluorescent lesions, on fundus autofluorescence frames, as well as an optically empty lesion between the RPE and the inner segment/outer segment interface, with clumping of hyper-reflective material on the posterior retinal surface, on time domain optical coherence tomography scan (F).